Facebook Live Easter-egg hunts? Peep flavored beer? When Easter falls on April Fool's Day, advertising is bound to be weird! Read these stories and more in this week's Inbound Marketing Highlights. Confectionery brand Cadbury is hosting a different kind of Easter Egg hunt with their 360-degree Facebook live Easter Egg Hunt. Social Media users were encouraged to log on and scour a virtual landscape for hidden eggs during a special one-hour event. The live video drew 200,000 spotters from across Australia. The first person to comment on the eggs' location would win it. “A Cadbury Easter is all about joy and wonder, and there’s nothing more exciting than scouring the backyard for every last egg, but why should the kids get all the fun? We wanted to create an experience that would remind all Australians of the happiness an Easter egg hunt brings.” - Ogilvy Melbourne's creative director. Collective Brewing Project has released a Peep flavored beer for Easter. The drink, appropriately named, “Peep This Collab” is made in conjunction with a local bar in Dallas. The sour ale contains more than 30 boxes of peeps as well as edible glitter. People describe the taste as “marshmallowy and lightly tart.” Collective Brewing Project grabbed mainstream attention last year for their “Cup O’Beer,” ramen-flavored drink. Although “Peep This Collab” is unusual, it isn’t the first time brewers have used Peeps in their beer. Three years ago, a brewery in Golden, Colorado offered a drink with Peeps, although the number of marshmallow treats used was a bit lower. In a major announcement, Peeps candy brand has named the Energizer Bunny their new Celebrity Creative Director to help “drum up new energy” for this year’s Easter line. The new Easter line will feature a pink bunny-shaped peep with sunglasses created to look like the Energizer Bunny. Peep states in their press release, "It's no surprise that Easter is THE holiday for PEEPS®, and after 65 years we needed 'some -bunny' to help re-energize the brand's product offerings and help us power up innovation." Sadly, they ended the press release by saying the whole thing is in fact, an April Fool’s Day joke. Peeps however, aren’t the only ones taking advantage of Easter being on April Fool’s Day. Reese’s took over a New Jersey supermarket and swapped out all of their chicken eggs with their own Reese’s Peanut Butter Crème Eggs. Shoppers who peeked inside the carton (most likely to check if any shells were broken) were surprised with the egg-shaped candies. Along with candies, they found messages in the carton such as “Our eggs found you,” “All pranks should be this good,” or “Congratulations you won our Easter egg hunt.” The reaction from shoppers was positive as they were all delighted by the surprise. The video was turned into a one-minute spot for their “Not What You Eggs-pected” campaign. Although this year, not every Easter ad is related to candy. This year, Sun Pacific is encouraging parents to swap out candy for Cuties - promoting better-for-you fruit instead of a sugary snack this Easter. How are they running their campaign? By using social media and influencers to drive up sales. The popular Cuties brand is teaming up with parenting influencers to promote seasonal recipes, DIYs, and family-friendly activities that will appear on Cuties Instagram and Facebook pages. 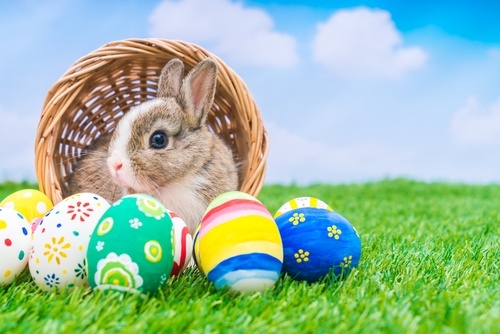 Retailers are encouraged to share posts such as ideas on Cutie-themed Easter baskets, gifts, and healthy spring snacks. According to a study done by W5, brand preference for Cuties remains highest in the industry and grows year over year. That's this week in Inbound Marketing Highlights. Happy Easter!